Book News: Gabriel García Márquez Left An Unpublished Manuscript : The Two-Way Also: a previously unpublished story by Shirley Jackson; tips to tell whether you are in a Charles Dickens novel. 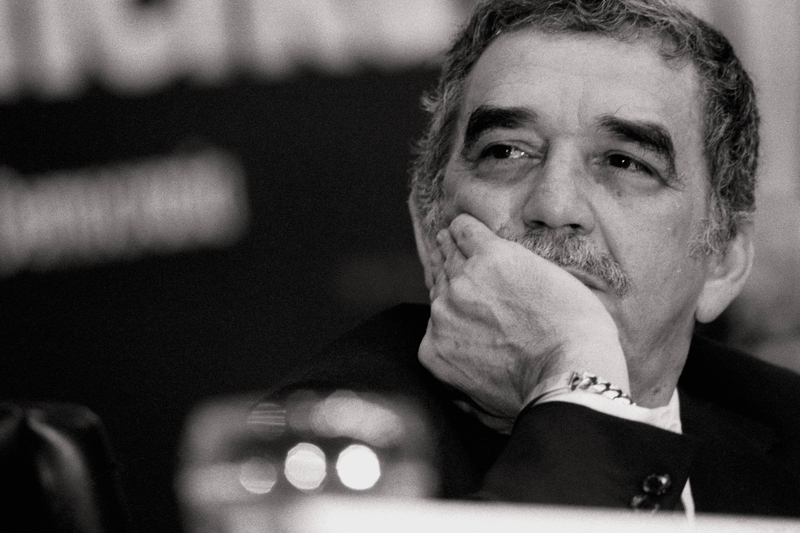 Writer Gabriel Garcia Marquez, who won the Nobel Prize in 1982, died last week at age 87. Gabriel García Márquez left behind an unpublished manuscript when he died last week at age 87, Cristobal Pera, editorial director of Penguin Random House Mexico, told The Associated Press. Pera added that García Marquez's family has not yet decided whether to publish it. Meanwhile, the Spanish newspaper La Vanguardia published an extract of the work, tentatively titled We'll See Each Other in August (En agosto nos vemos). In the excerpt, a middle-aged woman named Ana Magdalena Bach has a fling during her annual trip to a tropical island to put flowers on her mother's grave. She stays at a hotel overlooking a lagoon full of herons. Ana, though she's married, meets a man at the hotel and begins an affair with him. The excerpt has a strong sense of place — García Márquez's descriptions are lush with flowers and tropical life – and a ripple of eroticism travels through it, from the touch of perfume Ana puts behind her ear at the beginning of the chapter to the thunderstorm during her encounter with the man from the hotel. David Foster Wallace's estate and his former publisher have come out in opposition to the making of the forthcoming film The End of the Tour, which is based on Wallace's conversations with journalist David Lipsky. In a press release, the David Foster Wallace Literary Trust wrote, "This motion picture is loosely based on transcripts from an interview David consented to eighteen years ago for a magazine article about the publication of his novel, 'Infinite Jest.' That article was never published and David would never have agreed that those saved transcripts could later be repurposed as the basis of a movie." It added that "there is no circumstance under which the David Foster Wallace Literary Trust would have consented to the adaptation of this interview into a motion picture, and we do not consider it an homage." Wallace committed suicide in 2008. The Miguel de Cervantes Prize, the most prestigious literary award in the Spanish-speaking world, will be awarded to Mexican author Elena Poniatowska on Wednesday in Spain. Previously won by Jorge Luis Borges, Octavio Paz and Gabriel García Márquez among others, the prize is worth 125,000 euros (about $173,000). A previously unpublished story by Shirley Jackson, the writer best known for her story "The Lottery," is printed in The New Yorker. "The Man in the Woods" is a short, sinister story about a man named Christopher who walks through dark woods to find an isolated house surrounded by trees, "the forest only barely held back by the stone wall, edging as close to it as possible, pushing, as Christopher had felt since the day before, crowding up and embracing the little stone house in horrid possession." Comedian Megan Amram has a book deal for Science...For Her!, which she calls "a fun, flirty, Cosmopolitan-like textbook that is tailored to you, ladies." On her website, Amram describes the book as "a science textbook written by a lady (me) for other ladies (you, the Spice Girls, etc. )," and adds that "it has been demonstrated repeatedly throughout history: female brains aren't biologically constructed to understand scientific concepts, and tiny female hands aren't constructed to turn most textbooks' large, extra-heavy covers." Amram's book may be a parody, but it's not that all that far from reality: A 2013 book titled Girls Get Curves: Geometry Takes Shape combines math tips with advice on "how to attract guys," and uses handbag shapes to explain quadrilaterals.